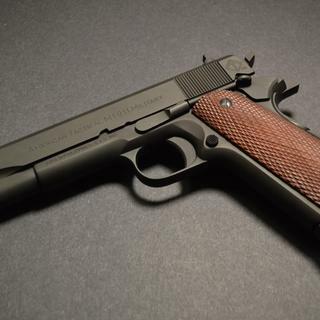 This 1911 FX45 is the Military model with all steel parts and solid mahogany grips. This is a full size 1911 style handgun, single-action, with 8 1 capacity. The FX45 is compatible with many different brands of 1911 magazines and parts as well. 1911 fans like the classic styling and proven reliability of the ATI 45FX Firepower Xtreme series. You can't beat what you get for this price! Looking for entry level 1911. Very good reviews on internet for this gun. My local FFL dealer agreed with me and has dealt with your company in the past. Good Price, for Christmas present to myself. Value for price. Recommended by family member who owns the same pistol. great reviews on this item. I love it! I've always wanted a 1911 military 45 ACP. Cant beat the price. Nicely built quality made handgun. Purchased this after my son showed me his. Good quality gun especially for the price. Took it to the range and worked flawlessly. I would recommend purchasing this gun. Quick shipping from G-A-G! This is a spectacular weapon at any price. For what I paid it is beyond spectacular. I cut open the bag, wiped the oil off and ran 100 rounds thru it with no stoppages. Really great deal everybody should get one. This is my favorite gun I own. Looks great and super reliable. This is a fantastic firearm ! I put some Pachmayr rosewood grips on it and I love it ! Awesome 1911 for the money!! Very nice! No complaints at all!!! Great gun, it was actually my very first handgun and I’m not disappointed. It’s a little rough to handle but once you’ve put a few rounds through it and cleaned it a bit it feels great to handle. The slide lock is a bit hard to reach but that’s a very minor set back. Fit and finish as good as my old Springfield (IL) GI model. Put about 25 rounds through the pistol without a problem during initial range trip...looking forward to more shooting next week and thereafter! I have had this pistol for 5 months and fired 500 + rounds through it and haven't had one malfunction. Some reviews say the magazine it comes with doesnt feed the last round correctly but I havent had a problem yet. I bought and used colt 7 round magazines which work fine. I've been wanting a 1911 for a while and caught these when they were priced well below $350 and pushed the button. It's been a great pistol so far, with around 2000 rounds through it. It's accurate and not picky with ammo or with magazines. I did have one problem with it after around 1200 rounds through it, where the ejector sheared off the pins in the frame, but my gunsmith was able to remove the pins broken off in the frame with no problem and fit a standard replacement ejector quickly and with minimum cost to me. I could have sent it to ATI for warranty work, but it was much faster to have my gunsmith fix it instead. I've run at least 800 rounds though it since with no problems. And my gunsmith was familiar with the quality of the ATI 1911 pistols and also said they were high quality, especially for their price point. If I were in the market for another I would buy it again. For a bargain priced 1911 this gun is an extremely accurate shooter. Great pistol for the money, especially if you want something a little simpler or comparable to a USGI 1911A1. Would have given it 5 stars but will only lock the slide back with the included mag. When using Surplus mags it doesn't pick the slide open. It seems that the protruding portion of the slide lock is not long enough to engage the following on usgi style mags. I'm looking for a replacement slide stop that I'm thinking with fix that problem. The ATI .45 is accurate and reliable. Is it a Wilson or Les Bear? Of course not. I do use it as a carry gun because it functions properly for me. A little white paint on the front sight made it easy to see. Carried this handgun in the Navy. Always wanted to own one for myself. Dreams come true. Shoots well, easy to take down and clean. Great gun!! Very accurate. Awesome deal. Great value, a good looking and performing 1911. The ATI FX 45 was upon receipt greased and dirty. The plastic case was damaged. Not a big deal and after a good cleaning, it performed very well. Solid lock up, very accurate at 7 and 25 yds. No malfunctions using FMJ. Next range session will try HP rounds. 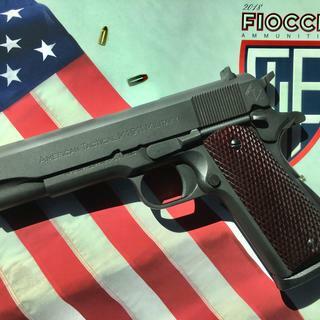 Being a fan and experienced 1911 shooter, this make/model is a fantastic value for an entry level pistol, it performed more like a higher priced make/model..
Great gun for the money!!! 0 regrets buying this gun vs one 2-3x more. About a 1000 rounds with no malfunctions, it's not a fancy gun but it's been reliable so far. It's fun to shoot, the trigger is all right and the price is good. A very decent entry level 1911 without the usual price of a 1911. Shipping was also fast. Overall satisfied with the product and the service. This is one of the best values on a 1911 type pistol out there. The fit of this pistol is easily as good as pistols costing twice as much. No rattles or excess play anywhere. The pistol is also very accurate and so far has digested everything I’ve run through it without a hiccup, 500 rounds so far and not a single problem. Trigger pull is very nice, 4.5 lbs or so, with a short take up and a crisp break. If I had the money I’d buy another one simply because it’s such a great pistol for the money. And what can I say about GrabaGun that hasn’t already been said. Best prices on the Internet and a great company to do business with. My Pistol was $339,. $367 with shipping and transfer fees added. Without doubt a great deal! Never thought it would be that good! I have had this 1911 for a couple of months and have had it to the range several times. It is a good reliable gun that gives me no problems. It is very well made. I have been carrying it on my hip every day for a few weeks and, although large, it is not too difficult to conceal. The ATI 1911 has proven to be a very good gun. Love this gun. It handles well. Has yet jam on me and has been on point for target practice. I didn’t need another 1911 but wanted something a bit more “GI”. I could not be happier with the ATI. Flawless and accurate. I can’t say anything bad about it. I would buy another one!! Fun gun at a great price. Looks good, shoots good, feels sturdy. I just need to shoot it a lot more. Get one! For the price, you can’t beat it. Over 500 rounds, not a single problem. Good quality, fun to shoot. Close copy of original WW2 1911. I bought one of these when they were on sale at Grabagun because I wanted a 1911 to wear in my replica WW2 shoulder holster. I must say I was surprised and impressed with the quality of this entry level weapon. Fit, finish and reliability is outstanding. Be sure to clean the weapon before you use it as there is a considerable amount of grease used at the factory. Very close copy of original WW2 1911. Grabagun's very reasonable shipping charges helped keep the price low..
Great gun for the price. Well made firearm. Looks great and fires everytime. I would recomend this gun and would not hesitate to carry it everywhere. This is an awesome handgun for the price. It eats everything I feed it & works with mags from different manufacturers. It feels great in my hand vs polymer framed guns. I took the ATI 1911 to the range and put one box of ammo down range without any problems. I used 5 magazines from 3 different companies and all 5 performed flawlessly. The only negative is that this gun shot low our of the box and I will have to work on the sights some. Out of the box this gun was a bit tight and I had to rack the slide for a few hours to loosen it up, but that was a fun job and it gave me something to do while looking at TV. I want to get back to the range very soon to put another 2 or 3 boxes of ammo through the gun, but I am certain that this gun will handle whatever I feed it. I may just have to spring for this gun in .22 caliber so I don't have to spend all my money on 45 ACP ammo. Grabagun provided very quick service to my FFL and they kept me informed of everything along the way. Great gun, great company and great price. I highly recommend this ATI 1911 to anyone who wants a well made classic firearm without having to break the bank. Very Impressive Pistol. First surprise was that the pistol came in a plastic hard case, as I was expecting the cardboard box that others have mentioned. Fit & finish are excellent and the slide to frame fit is extremely tight. Trigger is light and crisp, with minimal take-up and not a hint of creep. Pistol arrived soaked in oil as others have mentioned, but the insides were surprisingly dry. I wiped it down, lubed it, reassembled and headed off to the range. Functioning was 100% from the first round. I put about 100 rounds through it without so much as a hiccup, firing 230 gr Ball and 200 gr lead SWC ammo. I don’t know if I got the same type magazine as others have complained about, but the supplied “Act-Mag” (made in Italy and blued to a high polish) magazine functioned perfectly, even when loaded with eight rounds. Point of impact was dead on, and accuracy was well beyond my expectations, putting several rounds into one hole at 7 yards. My pistol didn’t come with an owners’ manual, but this is far from my first 1911, so I don’t really need one. I do see that they can be downloaded from the manufacturer’s website, if needed. Pistol comes with the “GI” sights and they’re a bit small for my old eyes, but they add to the fact that the pistol is a pretty-good representation of a military issued 1911. I could not be more surprised & pleased with the pistol. I purchased this ATI 1911 Military .45 ACP early in 2017. Been to the range several time and had put 300 rounds down range. I did not have a single mis-feed and was hitting center mass at 45 yards and heads shot at 25 yards. That 5" inch barrel makes a huge difference putting rounds on target at distance. 45 yards, for a hand gun, really give you a good ability to reach out and touch someone to protect your life and the lives of your love one's. Five Starts and you can't beat the price. Buy this gun if you want a 1911!!! Bought this 3 weeks ago, after waiting 30 years to finally get a 1911. I saved over $350 by getting an ATI FX45 vs a Colt, etc. This gun is exactly what I wanted! It won't win any beauty prize but it sure is an EDC workhorse! And dead on at 25 yards, out of the box! I may even buy another to customize. Bottom line, she ain't no thoroughbred, but she'll dang sure give you a smooth ride! I give it 95/100. This has become my favorite range gun. Very nice to shoot. The included mag had issues with 8 rounds loaded. 7 is fine. The gun itself looks great and has a great feel to it. Very pleased with it. Great pistol for the price! I bought mine almost a year ago. I've had it to the range several times so far. Put about 500 rounds thru it, and I'm very happy with it. It shoots dead on right out of the box. It's not a Colt, but then I didn't expect it to be. For the price, you can't ask for better performance. I liked it so much, I bought a second one for my daughter for her birthday, and she just loves hers! Compare features and see the Firepower Xtreme ATI FX45 1911 family of pistols.